A major report, published today by Badgerwatch Ireland and the UK's Badger Trust, calls on consumers to boycott Irish dairy and beef products and to boycott Ireland as a holiday destination. The fully-referenced report reveals that the virtual extermination of badgers in the Republic of Ireland, with up to 6,000 snares set every night, has failed to control bovine TB. Instead, levels are twice as high as in Great Britain, where badgers are not being culled. EU inspections have criticised Ireland for inadequate cattle movement monitoring and a wide variety of other failings which allow the spread of bovine TB between cattle. 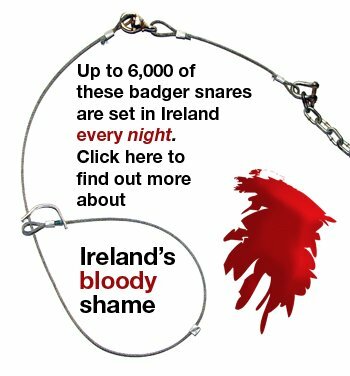 Trevor Lawson, report author and Badger Trust public affairs advisor, commented: "The official persecution of badgers in the Republic of Ireland is an international disgrace and must surely breach the Berne Convention, which protects badgers in Europe. "The grotesque extent of this extermination proves that killing badgers does not control or eradicate bovine TB in cattle. Badgers are a scapegoat for bad farming practices and an inadequate bovine TB testing regime. Our findings make a mockery of the demands for badger culling made in Britain by the National Farmers Union and other organisations." Bernie Barratt, from Badgerwatch Ireland, commented: "I am currently looking after two badger cubs whose mother has almost certainly been snared or shot. Many other cubs have starved to death because the Government insists on killing badgers when mothers have cubs below ground. The extermination of badgers in Ireland is now so extensive, that I have no idea whether it will ever be safe to release these cubs into the wild. "I am very proud of Ireland's many achievements, but this senseless slaughter is a horrible stain on my country's character. We have no choice but to bring this to the attention of international consumers, since our politicians lack the moral courage to protect our native wildlife."